Moxie's flavor is unique, as it is not as sweet as most modern soft drinks and is described by some as "bitter." Moxie is flavored with gentian root extract, an extremely bitter substance which was reputed to possess medicinal properties. Moxie has the distinction of being described as both "a great tasting soda" and "an acquired taste." However yo..
Moxie's flavor is unique, as it is not as sweet as most modern soft drinks and is described by some as "bitter." Moxie is flavored with gentian root extract, an extremely bitter substance which was reputed to possess medicinal properties. Moxie has the distinction of being described as both "a great tasting soda" and "an acquired taste." However you describe it, one thing is for sure, it takes a special kind of Moxie to try it for the first time.... and to love it forever. Live your life with Moxie, buy some. Moxie is the oldest continuously produced soft drink in the United States. Established in 1876 it was originally known as Moxie Nerve Food. It was claimed to be effective against "paralysis, softening of the brain, nervousness, and insomnia". A few years later, soda water was added to the formula, which is the iconic soda we have come to know and love as Moxie. With its unique and somewhat bitter flavor, Moxie is unlike any drink on the market. 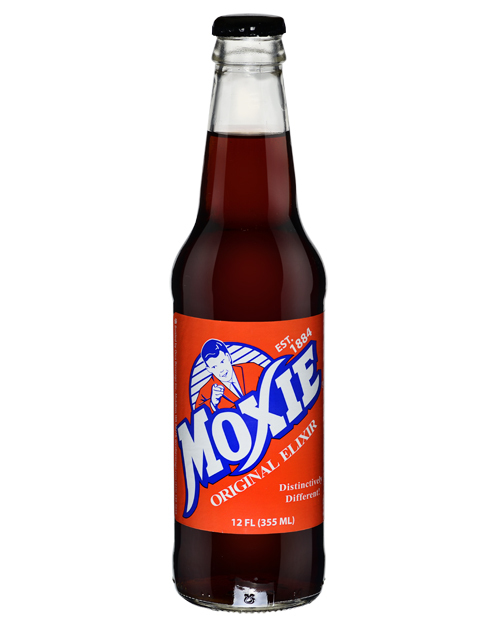 Moxie is closely associated with the state of Maine and was designated the official soft drink of Maine on May 10, 2005. Its creator, Dr. Augustin Thompson, was born in Union, Maine, but Moxie was invented and first produced in Lowell, Massachusetts.